The declaration of value signed by you or invoice for new goods. Our correspondent will tell you the expected transit time according to availability. Attention, this is only an indicative time: In application of the rules on aviation security, the sending of your shipment may be postponed (for example if the grouping has opaque areas during its passage X-ray ) .Also, we advise you to make sure with the Freight Service for the good reception of your shipments before moving. Upon arrival, your freight will be stored in the store awaiting pick-up or delivery. Pay attention to the shopping costs in some destinations if you do not come to look for your expedition beyond 2 or 3 days after its arrival! Packaging: The packages are handled many times during their transport, it is very important to ensure that each of your shipments has a sufficiently strong and robust packaging to avoid any damage. Because of the need to conduct customs visits, our correspondents must be able to access the contents of your shipments (leave a duplicate of the keys if closing). Please note that you can also obtain ad valorem insurance for the transport of your unaccompanied luggage (invoice required). For shipments with significant market value, there are specific shipping conditions – be sure to ask beforehand (eg art objects, etc.). Attention, the air regulations are complex and extremely strict, so do not hesitate to ask us about all the conditions of acceptance (limitation quantity / necessary documents / packaging …). Go light: LibertyBag picks up your luggage at home or from the place of your choice (*) and delivers it directly to the airport. And do not wait any longer: LibertyBag delivers your luggage to your hotel or the chosen place (*) as soon as your flight arrives. (*) for more information on the places covered by the LibertyBag service. (**) Each additional piece of luggage is charged € 10. How to take advantage of this offer ? Your reservation must be made no later than 3 days before the date of your departure. Your luggage and check-in follow the airport security rules. Baggage is packed and sealed to make it tamper-proof. To take advantage of this offer, please complete the form available by clicking on the banner below. Our partner Bagage Plus offers Corsairfly passengers departing from Fort-de-France and Pointe-à-Pitre a home service to pick up and check in their luggage and book their seats. Luggage Plus picks up your luggage the morning of departure, before noon, at the address of your choice. Your luggage is rimmed and sealed to make it tamper-proof. At your home, hotel or office, you complete the registration formalities: contact information, weighing, security and transfer of responsibility to Luggage Plus. You collect from Bagage Plus at the airport, your boarding pass, your plane ticket and your ID, 60 minutes before departure. Zone 1: Abymes, Baie-Mahault, Gosier, Pointe-à-Pitre, Ducos, Fort-de-France, Lamentin, Salt River, Saint-Esprit, Saint-Joseph. Zone 3 + 13,60 € TTC: Anse-Bertrand, Baillif, Basse-Terre, Boiling, Capesterre-Belle-Eau, Deshaies, Gourbeyre, Mold, Petit-Canal, Pointe-Noire, Port Louis, Saint-Claude, Saint-François , Sainte-Rose, Trois-Rivieres, Vieux-Fort, Vieux-Habitants, Vauclin, Sainte-Anne, Marin, Saint-Pierre and the north bounded by Trinity, Morne-Vert and Belle-Fontaine. Your luggage is transported for free within a certain weight limit which varies according to the destinations. Beyond this deductible, we will be obliged to ask you for a surcharge per excess kilo. Any package which does not respect these standards and which would be presented at the registration without prior agreement of the company will be refused. This baggage allowance allows for maximum baggage for maximum overall weight. Any package that does not meet these standards and that would be submitted for registration without prior agreement of the Company will be refused. For babies (0 to 2 years): a 10 kg baggage allowance is granted to our toddlers, regardless of the concept of baggage applicable to your destination. In addition, you can carry his stroller for free. For students, a specific franchise is granted upon presentation of a valid student card. In compliance with the safety rules in force in the air transport, we invite you to read carefully our advice to prepare your luggage. Indeed, many packages are not authorized for transport by plane or must respect a specific packaging to be accepted. (Pay particular attention to hidden dangerous goods!). In addition, the responsibility of the airline is limited in case of loss / theft or damage – additional insurance may sometimes be necessary. The responsibility of the customer is fully engaged in case of problems on board following the transport in the luggage carried in his name, of hazardous materials not declared at the registration. The diving bottles are accepted in the hold. They must imperatively be emptied and uncapped. They are part of the baggage allowance. For more information, for all special cases, do not hesitate to contact us on 0820 042 042. For reasons of hygiene and safety, a number of goods are absolutely prohibited on board, whether in the cabin or in the hold. Your responsibility is of course engaged if you transport one or more of these hazardous materials, not declared at the registration. Explosives: fireworks, Bengal fires, rockets, firecrackers, explosive catch baits, etc. Compressed gases, flammable or non-flammable: tear gas, stoves with refill or bottles of butane, gas cartridges, large quantities of aerosols, freon, helium, etc. Flammable liquids: oil stoves and refills, paints and thinners, varnishes, automotive lacquers, fuels, motor vehicles whose fuel tank is not completely drained (mopeds, motorcycles, go-carts, lawn mowers, chainsaws, generators), etc. Flammable solids: type matches matches, lights barbecue. Toxic products: toxic or anesthetic products, pesticides, insecticides, infectious substances or microbial cultures, etc. Organic peroxides and oxidants: common household products such as hydrogen peroxide, laundry, detergents, chemicals, liquid or powdered fertilizers (chlorate or nitrate), weed killers, etc. Radioactive material : material, products, instruments or devices containing a radioactive material, even if they are deemed to be exempt from regulation. Any corrosive products such as batteries, electrolytes, barometers and mercury thermometers, acids, bleach, etc. Dangerous goods (various): in the UN classification 9, is the carbo ice, and we transport it yet. On the other hand the passenger must inform the company, and not to exceed 2kg5 max per passenger, packaging allowing the release of carbon dioxide. If in doubt about the possibility of transporting certain goods (hold and cabin), we invite you to contact us at 0820.042.042. We remind you that your luggage must be locked, tagged inside and out with your name, first name and permanent address. For these last two categories in particular, we advise you to contract a private insurance guaranteeing this type of articles and protecting you in case of damage or loss. The sky is the limit for large families too! 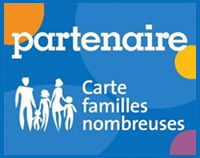 Corsairfly has become the leading airline partner for the large family discount card scheme (‘carte famille nombreuse’), enabling large families to benefit from a 15% reduction off the ex-tax prices of your tickets. This reduction applies to all Corsairfly destinations, during all travel periods, regardless of whether the family members travel together or separately. This offer applies to all regular destinations proposed by Corsairfly (excluding flights operated by partner airlines). Any person possessing a large family discount card can claim this reduction with no limitations on the transport period, regardless of whether the family travels separately or together. This offer may not be combined with promotional prices or with the specific reductions already proposed by Corsairfly. You can take advantage of this reduction by booking through your travel agent, at airport sales desks or on the www.corsairfly.comwebsite. A baby must always be accompanied by an adult (over the age of 18 / maximum of 1 baby per adult). When traveling with a baby, special care and attention is required. Download our special guide : Traveling with your baby. We do everything possible to ensure that our youngest passengers and their parents enjoy a comfortable and pleasant trip. Corsairfly can supply skycots free of charge for babies traveling on its flights. Please Note! The provision of a skycot is not automatic. As these are very much in demand, we strongly advise that you reserve your skycot when you purchase your ticket. You will receive a reply within 48 hours. To consult our contact page click here. Pushchairs can travel free of charge. You should mention if you have a pushchair at the time you check in, to ensure that it is properly labeled in the same way as a suitcase. However, to ensure maximum comfort for baby and for parents, you can keep your pushchair with you up until you board the aircraft, at which point it will be placed in the hold by our staff. Upon arrival, your pushchair will be placed on the luggage conveyor before the standard luggage items. Each baby’s needs are different. This is why we allow you to carry on-board everything you need for your baby during the flight (meals, nappies, baby bottles, other care items, etc). Our cabin crew will be happy to heat up bottles and baby food for you. A gift you’ll really appreciate: the Baby Pack. If you’re traveling with a baby aged under 2 years on a Corsairfly flight, a Baby Pack will be offered to you when you take your seat. You can use this as you wish, and naturally you can also take advantage of the other services already proposed (skycot, changing table, bottle warmer, etc). Provided free of charge by Corsairfly, this gift does not replace a meal.